Located in family friendly River Oaks, this 4 bedroom 2.1 bath executive home boasts designer finishes with over 2,844 sq ft of finished living space above grade plus an unfinished lower level waiting to be customized to suit your family's unique lifestyle. 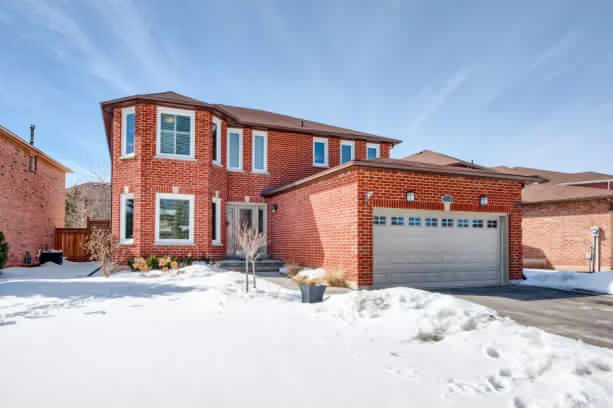 Nestled into private manicured grounds the deep pie shaped lot offers backyard privacy. The home has been updated with quality craftsmanship evidenced throughout including the gourmet eat-in quartz kitchen, updated granite bathrooms, rich hardwood flooring, crown molding, pot lighting and the tasteful light fixtures add an elegant vibrancy. The large windows throughout the home provides an abundance of natural light and come equipped with custom fitted window coverings. The updated eat-in gourmet kitchen includes crown molding, pot, track and valance lighting, glass display cabinets, double under-mount stainless steel sink with single leaver pull out spray faucet, quartz countertops, matching appliance package including built-in microwave and dishwasher. The main level also includes a separate Family Room with crown molding pot lighting and gas fire place with stone surround and Dining Room with tasteful pendant lighting. The generous sized Den, Laundry with custom cabinetry, sink, access to two car garage, and two piece Powder Room complete the main floor.